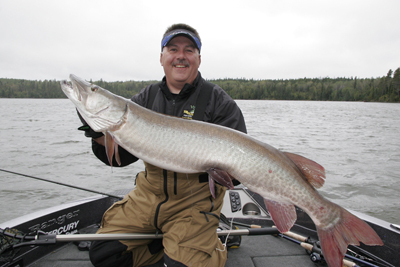 During 2015, I handled what was likely the worst musky rod I’ve ever used in the same year as I used the best. During a University of Esox Musky School in 2015, a student asked me to try the rod he had purchased specifically for the trip. It carried a well-known label, and having never cast a rod of that particular brand I took him up on the offer. The rod loaded nicely and cast well, though it was a little “tippy” for my taste. When I brought the twin-ten spinner into a figure-8, however, I was stunned by the rod’s poor performance. Not only did the soft tip flex too much to adequately handle the big bait, but the rod dragged through the water so much I didn’t want to complete the 8. 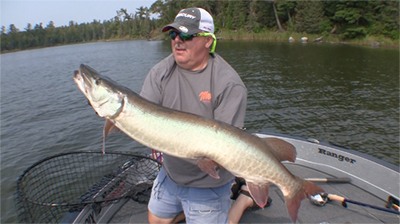 Yet here we were on Lake of the Woods, where over 50 percent of your musky catches will come in an 8 if you do them right! A figure-8 with that particular rod was a lot of work. I handed the rod back to the student after the single cast, said I thought it was a nice rod, and gladly went back to my own equipment. 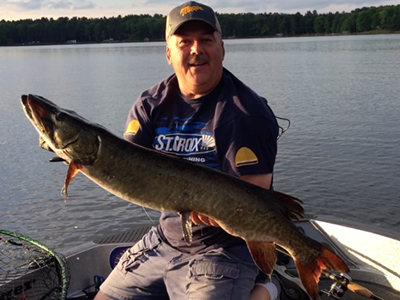 It took only two days for Steve Heiting to catch the first big musky with his new 9-foot Legend Elite musky rod. Belanger explained that rod “drag” in the water not only comes from a too-soft tip flexing, but also from a wider rod diameter and guides. Larger blanks and components aren’t streamlined and thus don’t “cut” water. St. Croix Rods turned the musky fishing world on its ear years ago when it introduced its Legend Tournament musky rod series. Anglers quickly learned that Croix’s proprietary Integrated Poly Curve (IPC), Advanced Reinforcing Technology (ART) and Fortified Resin System (FRS) really matter (click here to learn more). But St. Croix upped the ante during the 2015 sport show season when it introduced the new Legend Elite musky rod series. Musky hunters who checked out the rods were amazed at how much more “life” the rods seemed to have and the fact they were lighter in weight than comparable Legend Tournament models. The actions of the new Elites were even faster. More “life” means less effort to cast. A faster action equates to less casting effort, but also provides easier lure manipulation, better hooksets and less drag in the water. Lighter weight means less fatigue on a long day. The Legend Elites add Taper Enforcement Technology (TET), a higher modulus graphite, and better guides and reel seat to the IPC, ART and FRS features found on the Legend Tournaments. During 2015 I fished with three of the new Elites, the LEM86MHF, the LEM86HF and the LEM90HF. The Elite rods’ applications are equivalent to the comparable models in the LT series, so their uses were similar to the Long Ranger, Sling Blade and Big Nasty. For me, 2015 was a good year to test a high-end rod. I caught just as many muskies as I normally do, but nothing seemed to come easy. Long hours were required to catch what I caught. As St. Croix worked to catch up with orders for the new rods, they weren’t readily available to pro-staffers like me, so I had one of each model listed above. This meant my Legend Tournaments were still in play, so I was making a daily comparison between the rod series. I found that I subconsciously picked up the Legend Elites whenever possible. Probably because of their lighter weight and added “life,” they were just more fun to use. And, on several occasions, a musky strike was nothing more than my bait getting “heavy,” so using a more sensitive rod helped catch these light-hitting fish. The Legend Elite comes with a hefty price tag. Every angler must decide for him- or herself whether the benefits are worth the extra money. (I said the same thing when the Legend Tournaments were introduced about a decade ago.) 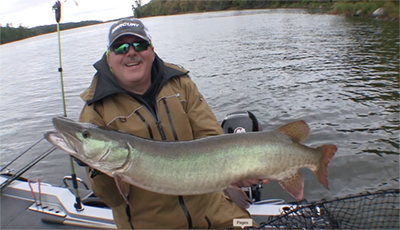 The ready acceptance of the Legend Tournament series is what prompted the management of St. Croix to produce an even better musky rod, and they have succeeded with the Legend Elite. The new standard in musky rods has been set. 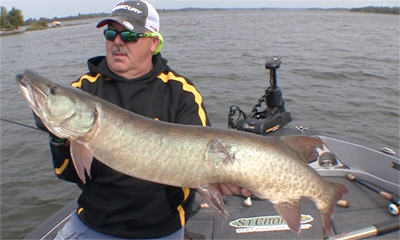 For more information on the Legend Elite musky rod series, click here.